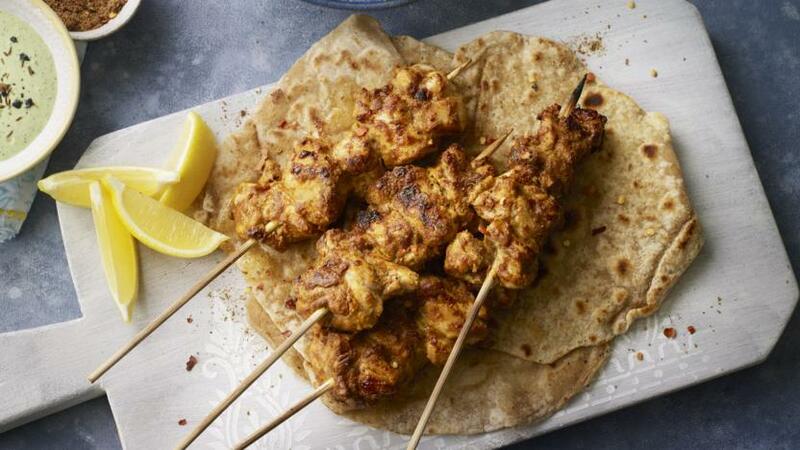 This authentic tandoori chicken tikka is succulent and sure to become a family favourite. The key to getting a tandoori taste is to use Greek-style yoghurt and to baste with melted ghee or butter while it cooks. You will need 5 wooden skewers. Mix together the ginger, garlic and chilli until you have a smooth paste. In a small bowl, mix the yoghurt with the gram flour until smooth. Stir in the ginger paste, chilli powder, paprika, coriander, garam masala, cinnamon, saffron and salt to taste. Stir well. Tip in the chicken and mix well. Cover with cling film and refrigerate for at least 30 minutes. Soak five wooden skewers in water for 10 minutes. Thread the chicken onto the skewers. Arrange them on a wire rack and place under the grill for 15–20 minutes. Every 5 minutes, carefully remove the skewers from the grill and baste with a little melted ghee or butter. Repeat until the chicken is cooked through and slightly charred around the edges. Serve immediately, sprinkled with chaat masala and lime juice, with parathas and salad.